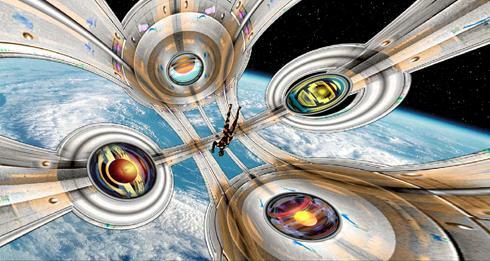 The idea underlying the Outer Space IP came as a result of the special nature of the year 2001 and can be understood as a reference to the epoch-making science-fiction movie "2001 - A Space Odyssey". We have given up control with traditional menus through the use of the avatar Pantha and for the first time, much attention was paid to the inclusion of voices. Media usually present two contrary ideas of ”the future”. For instance, extra-terrestrial life is imagined as being either mellow and wise, or brutal and destructive. We constructed Pantha, a hybrid being; artificially, but with male traits. He comments on the events and through his constant floating he clarifies the theme of the work - it is all about human disorientation in an environment characterised by technological feasibility. The space station is determined by human conditions. On the one hand there is a desire to comprehend the meaning of outer space and the encasing universe per se, on the other hand there is this condition of being lost in that environment.